To purchase Eververse Bounties in Destiny 2: Forsaken, you'll first need to know where to get Eververse Bounty Notes. In Destiny 2: Forsaken, players have been wondering where to get Eververse Bounty Notes. One reason why stems from the fact that in order to get Bright Dust rewards, you’ll first need to complete Eververse Bounties. In order to complete these Eververse Bounties, you’ll need to purchase them from Tess Everis using Eververse Bounty Notes. The inclusion of Eververse Bounties in Destiny 2: Forsaken is new, so it’s understandable that the knowledge on where to get the currency needed to purchase them (Eververse Bounty Notes) is limited. To help you out, we’ve put together a quick guide on where to get the Eververse Bounty Notes needed to purchase Eververse Bounties in Destiny 2: Forsaken! Visit Tess Everis to trade in your Eververse Bounty Notes for Eververse Bounties in Destiny 2: Forsaken. In order to purchase Eververse Bounties, you’ll first need to acquire a currency called Eververse Bounty Notes. The process of acquiring Eververse Bounty Notes is somewhat slow, but it’s worth it if you’re intent on purchasing Eververse Bounties and earning Bright Dust rewards. To get Eververse Bounty Notes, you’ll first need to reach level 50 in Destiny 2: Forsaken. At level 50, you’ll begin earning Steadfast Engrams for each additional level you reach. The more you level up, the more Steadfast Engrams you earn. To decrypt these Steadfast Engrams, you’ll need to pay a visit to Tess Everis. Decrypting Steadfast Engrams grants various rewards, including Eververse Bounty Notes. Be sure to save these Eververse Bounty Notes in your inventory, as most Eververse Bounties require multiple Eververse Bounty Notes to purchase. For example, we waited until we had 20 Eververse Bounty Notes in our inventory before we decided to purchase Eververse Bounties in Destiny 2: Forsaken. To acquire Eververse Bounty Notes, you'll need to earn Steadfast Engrams by leveling up in Destiny 2: Forsaken. To purchase an Eververse Bounty, simply return to Tess Everis and exchange your Eververse Bounty Notes for one or more of the Eververse Bounties she has on offer. Complete these Eververse Bounties, then return to Tess Everis again to collect your rewards, including the highly coveted Bright Dust in Destiny 2: Forsaken. Leveling up enough to amass a decent stockpile of Eververse Bounty Notes can be tedious. Fortunately, you can speed things up by doing things that boost your XP gain, including triggering Heroic Public Events. No matter how you decide to level up, the important thing is that you make use of the Steadfast Engrams you earn by having Tess Everis decrypt them. 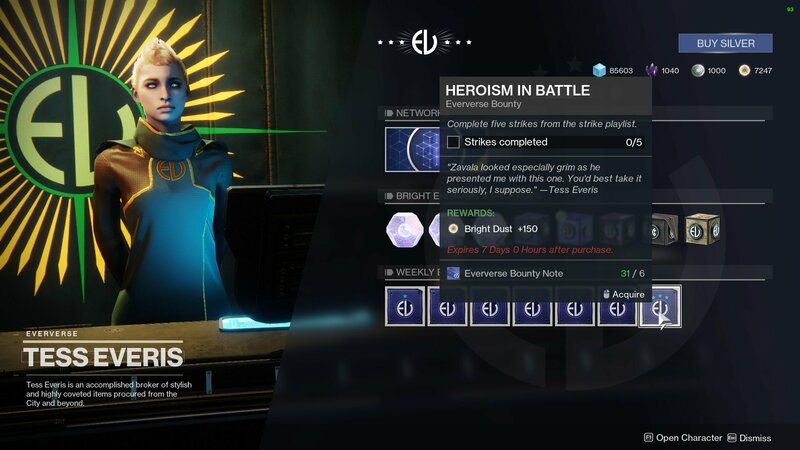 By saving up your Eververse Bounty Notes, you’ll have no trouble purchasing Eververse Bounties from Tess Everis, and completing them to earn rewards such as Bright Dust. 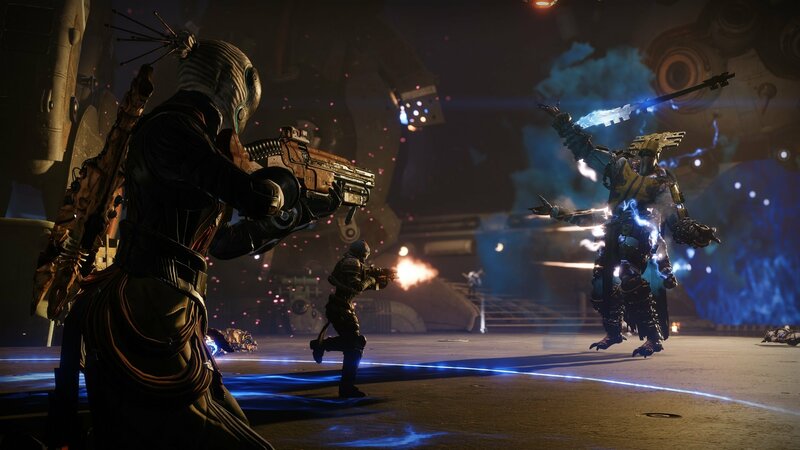 For more on Destiny 2: Forsaken, be sure to check out some of our previous guides including how to trigger the Ether Harvest Public Event in Destiny 2: Forsaken, how to activate the Cryo-Pod Public Event in Destiny 2: Forsaken, and where to get Prime Engrams in Destiny 2: Forsaken. By reading through this guide, you should now know where to get Eververse Bounty Notes and how to turn them in for Eververse Bounties in Destiny 2: Forsaken.